Design the perfect wedding in Lancaster County by experiencing its homemade food, scenic views, and old-world charm at Verdant View Farm Bed and Breakfast. Accommodations are available in a cottage with a fully-equipped kitchen or in the 1896 farmhouse. 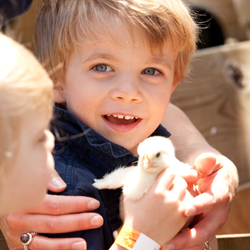 Discover the best of an authentic family farm – join the hosts for a family-style breakfast featuring homegrown and locally-sourced foods, and participate in farm activities like milking a cow, collecting eggs, and interacting with other farm animals. Verdant View Farm is an exceptional setting for one-of-a-kind wedding photographs. Nestled in the heart of PA Dutch Country and ideally located near the town of Strasburg, Verdant View Farm offers a memorable opportunity for visitors to re-connect with farm life and, most importantly, with each other. 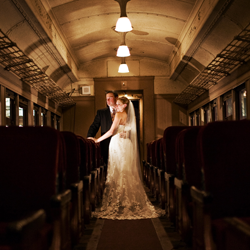 All aboard for your truly historic wedding at the Railroad Museum of Pennsylvania. The Museum’s impressive Rolling Stock Hall, which is home to a world-class collection of trains, provides a visually stunning and unquestionably unique venue for your special day. In a convenient location amid scenic Lancaster County farmland, the Museum also is a great choice as a setting for your engagement photos, wedding shower, rehearsal dinner or wedding reception. The Museum staff will work with you and/or your wedding planner to keep everything on track, providing referrals as requested for every possible amenity, including entertainment, caterers, florists, lodging and area guest activities. There are over 200 free individual parking spaces for your guests. 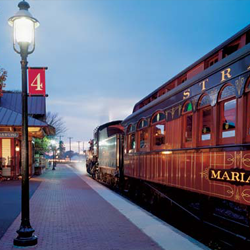 Begin your journey together by celebrating at the Strasburg Rail Road! Our historic venue is ideal for smaller weddings, rehearsal dinners, pre-wedding activities, photos, or your reception. Our beautifully decorated Parlor car gives any ceremony an elegant feel; while our 76-seat dining car provides a unique dinner experience. Travel back in time at our Station for wonderful photographs, or host a pre-wedding activity for out-of-town guests. We work with each couple to make your wedding a truly fun & memorable experience.